Introduction. Aging in mitotic and post-mitotic cells (J. Campisi, H.R. Warner). Age-associated changes in DNA repair and mutation rates (L. Grossman, S.-I. Moriwaki, S. Ray, R.E. Tarone, Qingyi Wei, K.H. Kraemer). Relationship of DNA repair capacity to species lifespan (R.W. Hart, A. Turturro, S.Y. Li). DNA base modifications in aging (J.W. Gaubatz). Models for studying genomic instability during aging (J. Vijg, H. Giese, M.E.T. Dollé). Effects of aging on gene specific repair (A. Richardson, ZhongMao Guo). Poly (ADP-RIBOSE) Polymerase and aging (D.S. Rosenthal, C.M. Simbulan-Rosenthal, Wen Fang Liu, M.E. Smulson). DNA instability, telomere dynamics, and cell transformation (R.J. Shmookler Reis, M.A. Shammas). Commitment signalling for apoptosis, or DNA repair and its relevance to aging and age-dependent diseases (E. Wang, R. Marcotte, H.T. Papaconstantinou, J. Papaconstantinou). DNA damage and its processing with aging: human premature aging syndromes as model systems (V.A. Bohr). Gene action at the Werner helicase locus: its role in the pathobiology of aging (J. Oshima, G.M. Martin, M.D. Gray, M. Poot, P.S. Rabinovitch). Inducible photoprotection in skin: evidence for a eukaryotic SOS response (M.S. Eller, B.A. Gilchrest). List of Contributors. Aging occurs at the level of individual cells, a complex interplay between intrinsic "programming" and exogenous "wear and tear", with genetically-determined cellular capacity to repair environmentally-induced DNA damage playing a central role in the rate of aging and its specific manifestations. 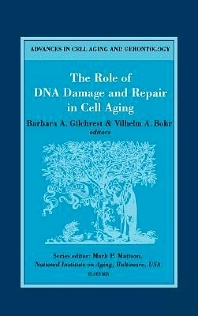 In 12 chapters, "The Role of DNA Damage and Repair in Cell Aging" provides an intellectual framework for aging of mitotic and post-mitotic cells, describes a variety of model systems for further studies, and reviews current concepts of DNA responses and their relationship to the phenomenon of aging. As part of a series entitled "Advances in Cell Aging and Gerontology," this volume also summarizes seminal recent discoveries such as the molecular basis for Werner syndrome (a mutant DNA helicase), the complementary roles of telomere shortening and telomerase activity in cell senescence versus immortalization, the role of apoptosis in the homeostasis of aging tissue, and the existence of an inducible SOS-like response in mammalian cells that minimizes DNA damage from repeatedly encountered injurious environmental agents. Insights into the relationship between cellular aging and age-associated diseases, particularly malignancies, are also provided in several chapters. This book is an excellent single source of information for anyone interested in DNA repair, mechanisms of aging, or certainly their intersection. Students will gain a general appreciation of these fields, but even the most senior investigators will benefit from the detailed coverage of rapidly advancing areas.